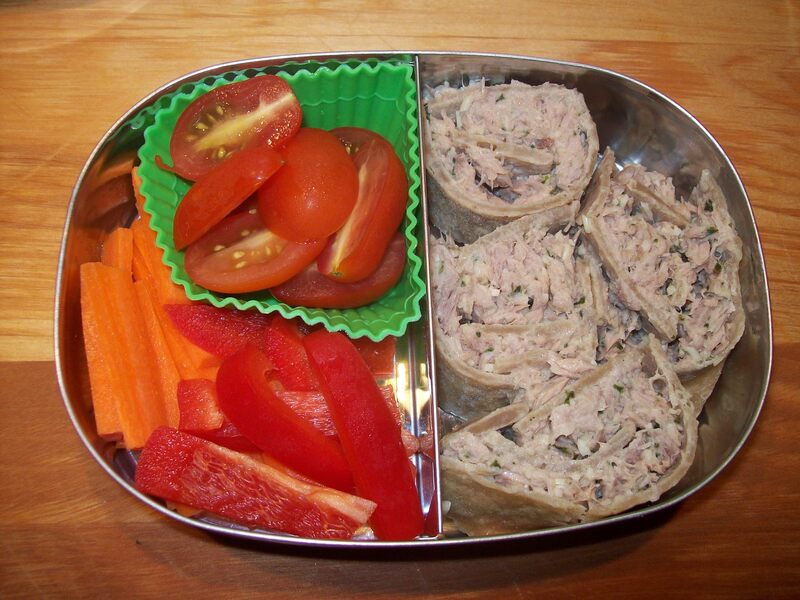 Pesto tuna rollups, served here with carrots, bell peppers, and grape tomatoes. L.’s a fish eating kind of kid. Ever since he grabbed his first taste of salmon straight off my dinner plate, at just 9 months old, he’s been chowing down on any and all seafood at every opportunity. This is the kid who begs for smoked bluefish in his lunches, so it’s probably not a huge shock to you if I say that he happens to like tuna. Now, L.’s not much more of a mayo fan than I am (which is to say, neither of us care for the stuff at all), so we usually make our tuna with a mixture of plain yogurt, lemon juice, and olive oil. It ends up light, fresh, and just slightly creamy, and it’s especially great on a tuna melt with some spinach leaves. But one day, confronted with a few tablespoons of leftover pesto in the fridge, I thought I’d try spicing up L.’s tuna a little bit and see what happened. What happened was that he loved it. I think I’d prefer mine on a toasted everything bagel, but L. liked this rollup version just fine. Mix tuna, yogurt, pesto, and lemon juice in a small bowl. Spread half the mixture all over each tortilla. Roll the tortillas up tightly around the tuna to form spirals. Slice each tortilla with a sharp serrated knife into four rollups. You could add spinach or lettuce leaves, or julienned bell peppers or carrots to these rolls as well.